The outcome of this one is about as close to the original game's artwork as I've been able to get. I'm proud of it in some ways because it's better than I thought I'd ever be capable of doing, though I have some criticisms for later. Let's do the good stuff first though, yeah? Unlike with the last several drawings, I allowed myself access to whatever tools I wanted to use. I'd originally been using only 1 or 2 on other projects, so I could focus on improving my hand. Now that I'd gained some comfort with that, I allowed the fancier tools like line stabilization, airbrush, paintbrush, soft erase, and so on. As a result, I was able to do what I think is my best shirt fabric so far. It really does seem to fold up and overlap like real, doesn't it? 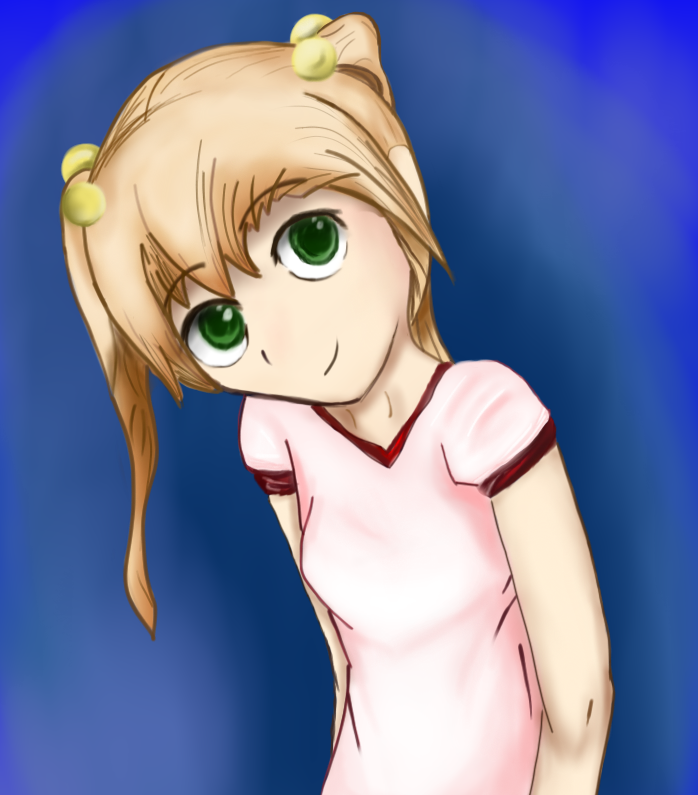 Emi's a pretty skinny girl, so her shirt is supposed to look a bit loose, and I think that comes across okay. The shirt is a "ringer" type that has elastics on the neck and arms, that tighten at the ends. That's something you don't really think about beforehand, as far as how to make it look that way, but I think I did okay. I'd say the whole thing is on par with that drawing of Rin from a year ago. The major difference is that Rin was done as a painstaking 1:1 copy of a picture I'd found on the internet. This one is all me, top to bottom. From pose sketch to shadows, from skin tone to those little "balls" on the hair ties. Cool, huh? I'd watched some YouTube tutorials on shading with the airbrush tool which helped a lot with just about everything. The hair also came together nicely. I used multiple layers on the hair alone, which was a process I was bit new to (I generally don't use that many). One of the tutorials I'd watched showed me to lay down a single base color, and then create a new layer on top of that for all of the highlights/shadows. It came out really nice and then I went to work outlining it for more details and strands. This helped me make the hair feel like it 'pops', and actually has some depth to it, while still being able to point out where it's pulled tight. Emi's hair consists of 2 pigtails, which means the area around the tails will be taut, and then she has loose bangs in front. That's the most complicated hair I've ever had to do, but I think I pulled it off, a little clumsiness aside. Noses and mouths are something I'll usually overthink. When you're doing anime-styled characters, it's usually okay to use little more than a single line for each, but this makes placement, thickenss and length incredibly important. In some cases it's best to just "imply" something is there, and I'm getting a little more comfortable with the how. Of course she has a nose, but to communicate that, you really only need to make a single line or dot. Before, I might have tried to do an "L" shape or an upside-down "7". I do have criticisms. Her front arm seems a little long, like the elbow should start higher. I'm not sure if I'm imagining that. Her head is also a little big, but I figured that it's not all that uncommon for anime and cartoons in general, so as I was working I decided not to address it. It would have been a pain anyway. The pose is also really similar to the Hanako drawing from before, and doesn't really offer anything "new"; it's certainly not a dynamic pose and in that area didn't really offer me a new challenge, unless you count the practice it provided. Otherwise, I think it's okay. So yeah, we're almost done. Next up is Lilly, and we can call the KS series quits. Like, numerically anyway. I'll probably still churn one of these out every so often.